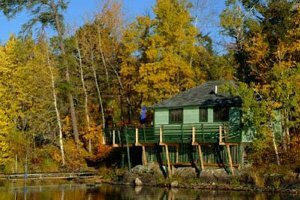 We invite you to leave your worries at home--and unwind in one of our inviting lakeside cabins on the edge of the Boundary Water Canoe Area Wilderness. Here you will find the perfect mix of cozy and contemporary, as modern amenities blend with panoramic views. All cabins feature a complimentary pontoon boat, new appliances, bath with shower, and conveniences such as coffee filters and kitchen soaps. For a small fee, our housekeeping service will allow you to maximize leisure time. Let the kids be lulled to sleep by the sound of the waves as you gaze at the stars or lose yourselves in the flickering warmth of a glowing campfire. The possibilities are limited only by your imagination, and our getaway packages make the dream of an affordable family vacation a welcome reality. This cabin is located on a quiet bay with a sandy beach only 35 feet from the back door. Three bedrooms feature one queen size bed, one double bed, a set of bunk beds and futon. The large deck is near the lake. Restored wooden and laminate floors. Electric baseboard heat and many windows. An 18' pontoon boat is included and parked on a private dock in front of the cabin. Sleeps 6-7.